There are times when you must make a slow-speed short-radius turn. For example, when doing a U-turn on a two-lane road. Most riders realize that you must lean your bike very aggressively to accomplish such a turn, but almost as many have no idea how to do that or why. That is, they find it difficult to rationalize a steep lean when all their prior experience argues that at slow speeds they need to keep their bikes as close to vertical as possible in order to prevent it from falling over. So, let's first look at the 'why' of it - why does a steep lean angle result in a short radius turn? If you were to draw a line through the axle of your front wheel and extend it toward the inside of your turn it would point to the center of that turn. If your bike was vertical while making the turn that line would not, however, be pointing at the ground. If there was a pole stuck in the ground at the center of your turn that line would intersect it at the height of your axle. In that case the radius of your turn would be the length of that line. Let's just say that the length of that imaginary line, the radius of the turn, was 30 feet in length. But, of course, your bike was leaned modestly toward the inside of the turn so the line would intersect that pole at some point lower than the height of your Axle. Indeed, if your lean angle was significant that line could actually intersect that pole below ground level. So now you know that the steeper the lean angle, the shorter the radius at any handlebar turn angle. 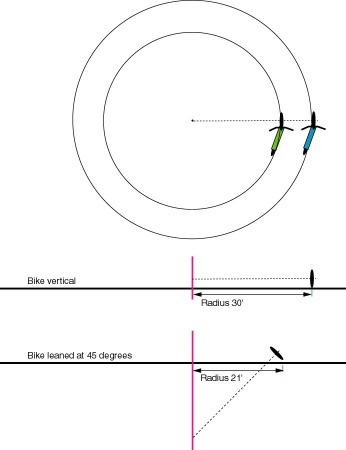 The diagram above is not intended to suggest that if you can ride a 30 foot radius curve at near vertical you can ride a 21 foot radius curve with a bike lean of 45 degrees. Rather, it shows the paths taken by a bike that has the same handlebar turn angle given different lean angles. The next thing you need to know is HOW TO LEAN the bike significantly at slow speeds. That is often done by offsetting your body toward the outside of the turn - usually called 'counter-balancing' - though it is certainly not necessary to do. When you do that the bike itself leans farther into the turn in order to maintain the same Center of Gravity. This, in turn, means that the force of gravity remains exactly balanced with centrifugal force so the bike neither falls into the turn nor widens the radius. I drew the picture pretty quickly and so its proportions are off but I think it accurately represents the concepts described. In the real world you do not ride circles very often. When you want to make a shortest radius turn at slow speeds you will over steer the handlebars into the turn (possibly with counterweight shifting) and cause the bike to 'fall' into the turn then you will increase speed and 'drive out of the fall' and into the path you wanted in the first place. If you did want to ride in a circle, however, then you will need to increase your speed to maintain a steep lean angle. For perspective ... if you were making a 30 foot radius turn at 10 MPH then your lean angle would be very close to 13 degrees. If you wanted to maintain that 30 foot radius turn but use a 45 degree lean angle you would need to do it at about 21 MPH. If you wanted to do a 21 foot radius turn with a lean angle of 45 degrees your speed would only have to be increased to about 18 MPH. A Canadian member (BC-Byron) of our motorcycles safety discussion forum produced a graphic that is reproduced below which contains all of the formulas necessary to calculate or verify the information contained in this article. One last thing ... does the height of your Center of Gravity determine whether or not you can make a short-radius turn or limit how short that radius can be because it limits lean angle? So just what part does the height of your Center of Gravity play? Though the height of your CofG does not affect lean angle it is the principal factor in determining when you will lose control of your bike in a turn when acceleration or deceleration are involved. The higher the CofG is relative to your wheelbase, the sooner you will lose control if you either accelerate or decelerate. That is, weight transfer is greater the higher the CofG is relative to wheelbase at any given acceleration or deceleration rate. Acceleration caused loss of control usually occurs as a result of losing traction on the front tire to the point that it slides. On the other hand, braking caused loss of control usually occurs as a result of losing traction on the rear tire to the point that it slides. High rates of acceleration or an unusually high CofG can cause the rear tire to lose traction before the front one does. Anyway, to get back on point ... no matter the height of your CofG, for any given speed and turn radius you will have the same lean angle. So, let's add some 'practical' information here beyond the geometry and physics. To perform a maximum lean, shortest radius, slow-speed turn you can counter-balance during the turn, though it is not necessary to do so (it merely makes it easier for some.) But how do you control the speed and manage centrifugal force? You control a motorcycle at slow speed primarily with your left hand! That is, by controlling your clutch's friction zone. You use your throttle only for the purpose of assuring that engine speed is greater than you need and you use the clutch lever to slip the clutch and manage your speed with vernier-like precision. What actually happens is that you steer (not counter-steer) your handlebars into the turn aggressively as you slide your body weight toward the outside of the turn, if you use counter-balancing, and let the bike lean as far as you want it to go. You pay attention to how your body feels - it becomes 'sensitive' to the balance of gravity and centrifugal forces and based on that feeling you adjust your speed WITH YOUR LEFT HAND. Experience (ain't practice grand?) changes doubt into familiar confidence. You will be able to 'dial in' the right combination of lean angle and shifted body weight almost instantly after you teach your body what the right combination feels like. This message describes a practice that I think is an ideal way to learn how to make short radius slow speed turns. You want to be able to make tight turns - sometimes they are necessary such as doing a U-turn on a two-lane road. To do so you MUST lean your bike farther than you would for a normal turn at that speed. As to dragging pegs ... that's just a limit indication. It's saying you have leaned it as far as you can safely do so, more or less.